If you live in Victoria, Australia and play any Super Smash Bros. game, join the Victorian Super Smash Bros Facebook Group! Prizes and medals! Everybody under one roof! Same venue as BAM! Park nearby or get off at Moreland train station! Don't worry about memorizing all this crap, the important stuff is the stage list for each game. 2. Once the tournament starts, any friendlies being played on marked tournament stations will be an instant DQ for both players. 4. Any tournament match that is being played that has not been called by a TO will result in both players being DQ'd. This will last until the TO deems it ok to carry on playing any Tournament match (usually by losers quarters). Sets are 2 stock (8 minute time limit), best of 3 games. Winner Semifinals, Winners Finals, Losers Semifinals and Losers Finals are best of 5 games (no bans in best of 5 games). The stage list may change. - Match 1 takes place on one of the 3 starter stages. - Rock/Paper/Scissors to determine which player 'strikes' a starter stage first. - First Player will strike 1 stage from the starters, Second Player will strike 1 stage from the starters, match proceeds on the last stage left in the starters. - The winner may ban ONE stage from the starters and counterpick, Loser picks what stage the next game is played on. - At this point the winner of game 1 may change character. After this, the loser of game 1 may change character. Then he next game in the set is played. Timic rule: If both players agree, they may play on any stage they wish, with any and all items on. Including Badges and Equipment. What if I have to play Matt G round 1? Wobbling is legal. Wobbling past 250% will be considered stalling and is not allowed. DSR: You cannot counter pick to any stage you have won on ever. Gentleman’s Clause: Any stage may be played on if both players agree to it. This rule takes priority over DSR. Players may NOT agree to change the number of matches to be played. Matches that time out will be determined by the remaining number of lives, then percentage of the current stock. In the event of a percentage tie, the match should be replayed in full. Sudden Death is not to be played, and will not count. A player/team may not counterpick to the stage they last won on. This includes the first match won via stage striking. Pausing the game shall only be legal while either player remains upon their OWN respawn platform, and only for the purpose of summoning a tournament official or in the case of a controller malfunction. All other pauses will incur a stock loss to the player who pauses the game. These times will be strictly enforced to make sure that each player will enjoy the full event on a timely manner. Neutral Start and Port Priority: Either player may enact this rule. Once enacted, both players may only use one of the two “Neutral Starting Positions”. A best of one game of Rock Paper Scissors may be used to determine who gets the higher port. If one player elects to Contest Port Priority and the other elects to Neutral Start, Neutral Start takes priority. If the game is paused accidentally while attempting to steal a life, the opposing team may deem that life forfeit. Wait until the announcer has finished saying defeated before pressing start, or turn pause off prior to beginning the match. Prior to starting this match, either player may elect to Contest Port Priority or Neutral Start. Note: Only one of these two may be used, as both have a built in Port Selection mechanism using RPS. If there is a situation where a player would like to change which option they elected after playing the game of RPS, it is the opponent’s choice to allow it. The results from the previously played game of RPS will carry over. Players take turns removing stages from the Neutral Stages list above based upon the results of the previous rule. The first player to strike removes one(1) stage from the list, the second player removes two(2), and the first player then chooses from the remaining two(2) stages. Winning player of the preceding match bans a stage from the full list of stages, both Neutral and Counter-Pick. Does not apply to Best of 5 sets. The Losing player of the preceding match picks a stage for the next match. Cannot choose the stage banned in the previous step, nor a stage they've already won on during this set, unless agreed. Repeat Steps 5 through 10 for all subsequent matches until the set is complete. Players take turns removing stages from the Neutral Stages list above based upon the results of the previous rule. The first player to strike removes one(1) stage from the list, the second player removes two(2), the first player removes two(2) and the second player then chooses from the remaining two(2) stages. Winning player of the preceding match bans three stages from the full list of stages, both Neutral and Counter-Pick. Does not apply to Best of 5 sets. The winner is determined by a best of 5 set in most cases; winner's/loser's semi finals are best of 7 and winner's loser's finals and grand finals are determined by a best of 9. Meta Knight’s infinite dimensional cape and extended dimensional cape are banned. There is a 15 Ledge Grab Limit for all characters. If a game goes to time and one player goes over the Ledge Grab Limit for their character, they will automatically lose the game. If both players exceed their Ledge Grab Limit, then this rule is ignored. The act of stalling is banned: stalling is intentionally making the game unplayable: Such as becoming invisible, continuing infinites, chain grabs, or uninterrupted moves past 300%, and reaching a position that your opponent can never reach you. In the event of a match going to time, the winner will be determined by who has less percent (stock difference still takes priority but will be shown in the results screen). If the match ends with both players dying at the same time coincidentally, or if time ran out with both players at equal percent, a one stock three minute rematch will be played on the same stage. For a tie-breaker match, a Ledge Grab Limit of 15 is used for all characters. If a match is ended via suicide move, the initiator of the move wins. Modified DSR: A player/team may not counter-pick the last stage they won on in the current set. The M2K rule: By entering this tournament, a player agrees to play their matches on any setup requested by the TO, and agree to have their matches recorded, commentated, and/or uploaded as the TO sees fit. Any acts of forfeiting, match fixing, pot splitting and/or bracket manipulation are subject to punishment from the TO. * If a player travels under the stage, they must land on stage before they are allowed to fly under the stage again. Landing on a platform or grabbing a ledge does not constitute landing on stage. *If a player is found to be performing the act of scrooging by a tournament organizer (by his/her discretion), the player will forfeit that match. Each Team selects one controller port to use for each Player. Each Team selects one character for each Player. A double blind pick may be called by any player. The first game is played on a Stage selected from the Starter Stage List either by mutual consent or through the Stage Striking Method. 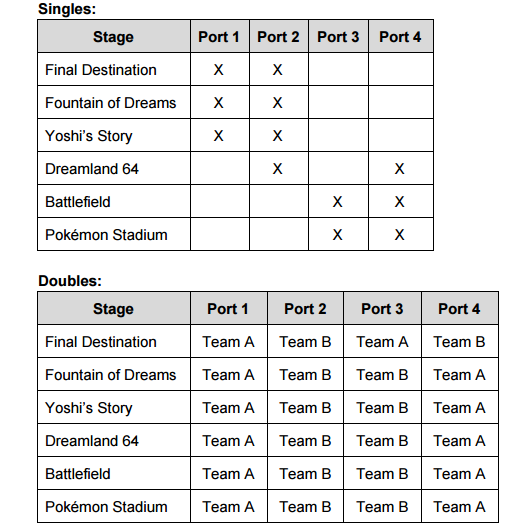 The order of stage striking will be 1-2-1 (Team 1 strikes one stage, followed by Team 2 striking two stages, with Team 1 then striking one of the two remaining stages). The first match is played. The team that lost the previous match may opt to re-pick controller ports (with themselves picking first). The Team that won the previous match may announce one “Stage Ban” if they have not already done so in this set. The Team that lost the previous match announces the stage for the next match from either the Starter or the Counter-pick Stage List. Any Stage named as a “Stage Ban” by the either Team may not be selected. No Stage may be used by a Team that has already won on that Stage in this set. The Team that won the previous match chooses one character for each Player. The Team that lost the previous match chooses one character for each Player. The next match is played. Repeat steps 6-11 for all proceeding matches. Teams will use a random method such as Rock-Paper-Scissors, Coin Flip, or Game and Watch Judgment, where the winner selects either first choice in port selection or first choice in stage striking. Whichever team does not receive first choice in port selection will be compensated with first choice in stage striking. Double Blind: Either player may request that a double blind selection occur. In this situation, a 3rd party should be told, in secret, each of player’s choices for the first round. Both players are to then select their first round character, with the 3rd party validating that the character selected is the same as their word. Contest Port Priority: If an agreement cannot be made as to who gets what port, the players may enact a best of 1 game of Rock Paper Scissors. Winner gets their port selection, loser selects any other port. Neutral Start: Either player may enact this rule. Once enacted, both players may only use one of the two “Neutral Starting Positions”. A best of one game of Rock Paper Scissors may be used to determine who gets the higher port. If one player elects to Contest Port Priority and the other elects to Neutral Start, Neutral Start takes priority. DSR: A player/team may not pick any stage they previously won on. Forced Character Selection: The losing player once had the option to select Random Stage as their counterpick and remove the option to change characters from the winner of the previous round. This is no longer legal. If a player wishes to select Random Stage as their counterpick, the winner of the previous round may choose to change their character. Stage Striking: Players eliminate stages from the Starter/Neutral list until there is one stage remaining. The main thing to remember is that smash tournaments are Double Elimination. That means if you lose a match you are still in the tournament. You then go into the "losers bracket" and play other people who have also lost a match. Eventually the winner of the losers bracket plays the winner of the winners bracket in the grand finals. This means a player can win the tournament even if the lose their first match! Regular attendees are always happy to help you out with the rules of the tournament and share advice on characters, strategies and matchups. "Is this for pros only?" - The tournaments are open for everybody. The skill range is diverse, so don't be discouraged from attending. Not everyone that comes to the tournaments are competitive. Most are friendly and welcoming of new people. A lot of us are also a fair lot more outgoing than your average gamer. We are a community-based legion of Smash Brothers. "What is the average age of a Smasher?" - Smashers are your typical gamer age. Those that come to the tournaments are between 14 and 25 years old. Bring a friend. Or two. "Who's controller are you using?" - JUCI's (pronounced 'jucky'). No really, don't waste your time scrolling through this thread, just join the Victorian Super Smash Bros Facebook Group! Awesomeeeeee, been missing the monthlies lately. Awesome, quick walk from the station. Can't wait. Not that I'm fused I guess, makes paying the venue fee easier lol. Btw, are these rules confirmed or was this mostly a copy and paste from the last thread? If not then I wouldn't mind helping you tweak the rules a bit, (mostly more stages). Even an MK ban is possible still, we'll talk about rules and stages at length another time Leish. Was just curious is all. We can worry about a proper ruleset when it gets close to a confirmed date. 31st of march was a possibility right? it's about time we gave the westside some love, anyway. i don't think we've ever had regular tournaments that way. Are d3/Diddy/marth allowed to chaingrab forever? - are you sure it's $5 venue fee...? Only brought it up since the ice climber infinite is limited, so the other ones should be too. they're not all limited to 300%? I guess the thread will be updated once jei finishes moving out and has spare time on his hands. But i guess throwing out some suggestions is a good reminder haha. I guess we can let you run the melee rule-set dekar? Or whoever wants to I guess. But yes, OP will be updated laterssssss. I thought they were staying back at box hill or something, that's what I read in the last thread anyway but oh well. ya lets discuss mk for the billion'th time. make up your fu king minds so i know which character im ALLOWED to use. But I was asking questions =P. Well as I said before, when Jei is ready we'll have a quick discussion about whats happening regarding the ruleset. Anyway, thanks for clarifying dekar. I only skimmed through the other thread not paying proper attention. you guys seem to always be having trouble with couch warriors, so I propose you have a HR rep to handle your dealings with couch warriors for you. I've been vocally antibAn since apex. I would like mk banned in doubles though. mk is not the only character whose strengths are exaggerated. try gaw or lucario 1HITKO. Gw/lucario are both boosted in doubles, but mk is boosted to a significantly higher degree. In singles, he is not the best character in every situation. In doubles, however, he is. And doubles statistics heavily reflect this. You can say he is the best in singles, but at least other characters frequent the top placings. In doubles, they never do. i don't agree he is the best character IN EVERY SITUATION. ultimate razer, gnes(DIDDY SNAKE), chudat and fatal (KIRBY SNAKE), blackaness and teevee(ZSS GAW) at APEX. hey j, whats japan + america + europes insight on BANNING mk in doubles? As far as im aware a double mk team has NEVER won a major in Australia. So even if double mk is broken in America, it clearly isn't here. At least not at the moment. And I'm wondering who actually thinks double mk should be banned apart from Attila? ergh. wish i could find those stats. so why is he allowed in doubles again? can we have a top 10 listing of all the metaknight doubles results in australia? Save the debate until we actually confirm a ruleset guys. lul.